We recommend the Quest SV for minivan buyers who end their search on the Nissan. It has standard Bluetooth, a USB port, power sliding side doors, and all the performance of the more expensive models, for about $32,000. 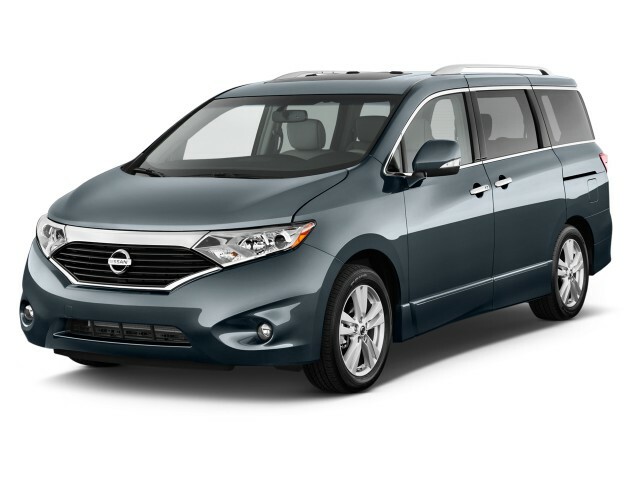 Road manners are good--but when it comes to core minivan duties like seating and safety, the 2013 Nissan Quest falls behind every other minivan on the market. The minivan herd has slowly thinned itself out over the years. It's now down to the Chrysler minivans, the Honda Odyssey, the Toyota Sienna--and the Nissan Quest, now in its third generation. The latest Quest comes to us as a version of the Japanese-market Elgrand, and with it comes some compromises that makes it the least flexible minivan. 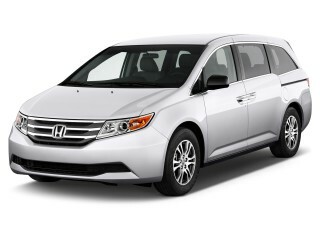 It's also the minivan with the best road manners, which makes it an unusual choice--and it also is one without a Top Safety Pick award from the IIHS. It's still better than many crossovers for people-hauling duties, but in its own class, it's playing catch-up. With an upright stance and lots of flared lines in front, the Quest's straight-edged passenger box bears more than a passing resemblance to the Ford Flex, mostly at its pillarless greenhouse and its almost vertical tail. The interior is more formal and less risky, with woodgrain trim on a plain dash that stacks some controls in unintuitive places. The audio knobs and switches, for examples, are grouped into two locations, some to the right of the shifter, halfway out of sight. The Quest's use of space is a little disappointing. It's still a big vehicle in the grander scheme, and front-seat passengers won't lack for leg or head room, or for storage of small items. From there, the Quest slips behind other minivans, first with sliding side doors that don't open wide enough to load in large people or objects. The second-row seats fold forward, but don't disappear into the floor, and they can't be removed. The third-row seat folds flat, too, but stays in place while every other minivan's third-row seat folds away to create a flat cargo floor. A lot of usable space is lost in the process, and in a type of vehicle that places a priority on seating, space, and safety, it's a letdown. Safety and features are an area for improvement. The IIHS says the Quest earns "good" ratings for front and side impacts, but gives it "acceptable" scores for roof crush. The base van comes with the usual airbags and stability control, but all-wheel drive is not offered, and to get Bluetooth and a rearview camera--essential safety items, we think--you'll have to spend more than $32,000. With major options--such as power side doors and a power tailgate; leather; satellite radio; and a DVD entertainment system--it's possible to spend nearly $40,000 on Nissan's minivan. As for performance? It's a highlight. A 3.5-liter V-6, coupled to a continuously variable transmission, is the Quest's only powertrain. It doesn't grumble as much here as it does in some other Nissans, and it's pretty perky for such a large vehicle. The steering has good feedback, the CVT has some pre-programmed "shift' points to cut down on typically rubbery response, and body roll is tempered more than in other big minivans. In all, the Quest has the best handling of its kind, which follows its slightly more compact footprint. 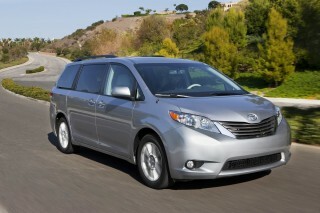 Gas mileage is among the lowest of the front-drive minivans, though. 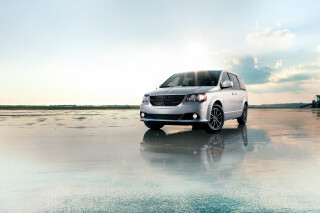 A good-looking minivan, the Quest owes some visual name-checks to the Ford Flex. If you recall the Nissan Quest from the 1990s and from the 2000s, the current minivan may or may not come as a surprise. Each generation of Nissan's family hauler has been a distinctly styled vehicle unrelated to the others. Most recently, it was a rather swoopy-looking vehicle that broke new ground for the segment--sometimes for the better, sometimes for the worse. This time around, the Quest relies on a Japanese-market van for its fundamentals, so it's by nature more upright, and more boxy than before. In a way, it's faintly hip, especially from the sides, where it bears a passing resemblance to the Ford Flex. At the front, Nissan's stylists have done a fair job of making the nose look smaller and lower, and lighter too with large air inlets. It's capped at the rear with large taillights, faired in for better aerodynamic duty. Inside, the Quest strays a lot less from the minivan norm, but you'd have to sum up the look as modern-retro Japanese, with its stacking of rectangles and plain-looking LCD displays. There’s a wide span of woodgrain trim across the dash for relief from the plastics, and it’s not too objectionable, but the shiny gray plastic surrounding the utilitarian-looking climate and audio controls doesn’t match it well. The transmission lever lines up vertically on the center stack, and it blocks the driver's view of some knobs and buttons. Atop these controls, Nissan parks an LCD screen slots. The screen is offered on mid-level models, where it’s a simpler 4.3-inch LCD. On top models the screen grows to 8 inches and incorporates more audio and navigation controls. A deck of buttons sits at the screens’ feet, piano-key style. If you're not accustomed to playing, you'll wish you'd studied, as you figure out the Quest's audio controls. Good road manners and a flexible CVT and V-6 drivetrain are the Quest's best features. By minivan standards, it's entertaining to drive. The Nissan Quest's steering and its smaller feel on the road are better than most minivans, and even its transmission works well with the minivan mission at hand. The Quest gets its power from a version of Nissan's tried and true 3.5-liter V-6. Here, it churns out 260 horsepower and 240 pound-feet of torque. In this application, it's a little less audible, and a little smoother, than we've experienced in some other Nissans of its vintage--though the newest 2013 Altima does the best job of all at muting the engine at speed. The Quest never feels strained. The continuously variable transmission (CVT) that takes the place of a conventional, stepped-gear automatic is a workable solution here. CVTs use belts and pulleys to constantly change "gear" ratios, and in many cases, feel sluggish to respond, and can also amplify noise and vibration since they linger at high engine speeds, without downshifts to relieve the racket. Since minivans don't require, or even encourage, sporty driving, the typically slow CVT response to throttle inputs isn't a concern. This CVT also has some preset "shift" points that simulate a six-speed automatic that reinstate some of the feel of a conventional automatic. Most important of all, the drivetrain's sized right for the package. With an independent suspension at all four corners, the Quest benefits from a smaller footprint than other minivans. It feels the most nimble of all its competitors, and in big part, that's due to the electrohydraulic steering. Using signals to direct the power steering's hydraulic pump instead of a belt, the Quest delivers the most natural steering feel of its class--though the electronic power steering in the Toyota Sienna is quite good, it doesn't rebound from inputs with the same relaxed feel. That said, it's still a minivan, and as direct as its steering can be, and as well as it damps out road surfaces, the Quest corners and accelerates with almost nothing but safety in mind. It doesn't bound over long bumps like the Chrysler minivans, though, and its near-equal curb weight seems to be damped more effectively. No more fold-away seats with this Quest--the packaging's tighter too, making it the least useful of a very useful set of vehicles. Since it's moved from a factory in Mississippi to one in Japan, the Nissan Quest has undergone a transformation. It's no longer a big minivan with all kinds of flip-and-fold flexibility. Instead, it's a somewhat less useful package that's still very capable of toting people and cargo better than almost any crossover you can name. In terms of overall length and wheelbase, the Quest isn't that much smaller than the Chrysler minivans, the Toyota Sienna, or the Honda Odyssey. At 200.8 inches long, on a 118.1-inch wheelbase, it's reasonably close to those competitors in almost every dimension. Where it loses out is interior volume: its fixed seats take up space where a good fold-away third-row seat would leave a flatter cargo floor--and where the Chrysler vans' fold-away second-row seats would win the functionality wars, every time. The Quest has few flaws, from the front seats. There's ample leg room and head room, and large adults will fit comfortably in its plushly upholstered buckets. The view ahead reminds us a lot of the first Japanese minivans that came to the U.S. in the 1980s, with a flat dash structure that makes for easy entry and exit, along with wide doors. The trouble starts in the second row, where the Quest's sliding side doors don't retract enough for adults to clamber up and into the seats with ease. It can be difficult to maneuver a car seat into the opening--never mind a kid with a mind of their own. The Quest lacks a middle seat position, which means the other eight-passenger minivans have a one-seat advantage over it. The Quest's third-row seat is cramped for adults, acceptable for kids. In either the second or third rows, the seats themselves are nicely angled and supportive, but they don't move--the seatbacks just fold over when more cargo area is needed. That more than anything makes the Quest feel as small as it is inside, that and its relatively high load floor. The seats fold easily enough, thanks to levers and pull straps. However, if you order the power assist for the third-row seat, know that it stops short of raising the seat all the way. Oddly, it gives up at the vertical position, leaving owners to use a cloth strap to finish the job. Since the seats no longer store in the floor, as they did in the old Quest, cargo volume is way down. In all, the Quest has 35 cubic feet behind its third-row seats, 64 cubic feet with the third row folded, and 108 cubic feet with the second row folded. The next Kia Sedona has folding second-row seats like the Quest—but still offers up 32 cubic feet, 80 cubic feet, and 142 cubic feet of space. The Chryslers have their class-leading, fold-in-the-floor seats on some models—and with them, they can boast of 33 cubic feet, 83 cubic feet and 144 cubic feet, respectively. The humongous Sienna has 39 cubic feet, 87 cubic feet, and as much as 150 cubic feet of space with the second-row seats folded up and the third row tucked away, respectively. The Odyssey has 38 cubic feet, a vast 93 cubic feet, and 149 cubic feet of space behind the respective rows. Other compromises are less noticeable, but they're there. There's no telescoping steering wheel with the Quest, though the high seating position makes the most of the situation. It offers up 16 cup and bottle holders, though the pop-out pair under the radio are big enough only for cans. More models get a rearview camera, but the Quest's roof-crush crash scores place it low in the minivan ranks. With some crash-test scores in, the Nissan Quest doesn't fare as well as its minivan competitors, and it lacks some of the latest technology that's been fitted to the class leaders, too. The Insurance Institute for Highway Safety (IIHS) has tested the current Quest under its new regimen, which includes a roof-crush score. The Quest does well in front-impact and side-impact tests, but in the roof-strength test, it earns an "acceptable" rating--the lowest in the segment, aside from the outgoing Kia Sedona. That score prevents the Quest from earning the IIHS' Top Safety Pick designation, a key for a vehicle in such a safety-conscious segment. The National Highway Traffic Safety Administration (NHTSA) hasn't yet crash-tested the current Quest. The Quest does have a good amount of standard safety equipment, though it's far from class-leading. Dual front, side and curtain airbags are standard; so are anti-lock brakes, traction and stability control. A rearview camera is standard on the top three trim levels, with a 360-degree-view camera on the LE, but none is unavailable on the base Quest. The top Quest model also has a blind-spot warning system. Nissan's tire-pressure monitors are standard as well, and they beep a warning at drivers when a tire is low. On models with power sliding side doors, a periodic beep signals the doors' closing. 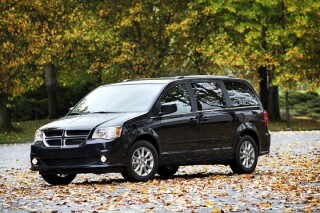 It's tough to find some of the features we'd demand in a minivan, in any Quest priced below $30,000. The Nissan Quest isn't the innovator in minivans, when it comes to infotainment or luxury features. 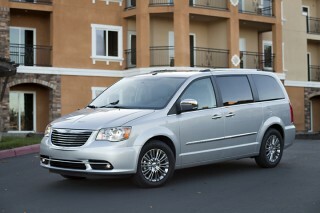 That title goes to the Chrysler minivans, with the Toyota Sienna a close second. The Quest does come relatively well-equipped in mid-level versions, but like the other Japanese-brand minivans, it can get quite expensive when all the luxury features are added. Every Quest comes with power windows, locks, and mirrors; an AM/FM/CD changer (a dying breed); climate control; and pushbutton start. The base model doesn't offer some nearly ubiquitous features at all--there's no option at all for satellite radio, a rearview camera, or Bluetooth. The Quest SV is the most popular model and our recommendation, since it bundles the most convenient features at the lowest price. From the low $30,000, this model has standard Bluetooth; a USB port; power sliding side doors; a rearview camera; automatic climate control; and a 4.3-inch LCD audio display. The audio system deserves some study before you buy: it's split into two locations, with some controls clustered under the LCD screen, and the rest tucked away near the gear selector. It can be confusing to scroll through audio functions up top, and to select radio presets and volume levels below. In the high $30,000 range, the Quest SL verges on luxury territory, with standard 18-inch wheels; power tailgate; leather seating and power passenger front seat; heated mirrors; heated front seats; and automatic headlights. At more than $42,000, the Quest LE gains a standard navigation system; satellite radio; power assist for the third-row seat; a DVD entertainment system with a sharp 11-inch screen; blind-spot detectors; a 360-degree AroundView camera; and xenon headlights. The Quest offers few options. The DVD player is available on the SV and SL, while a Bose speaker package is offered on the SL. Satellite radio is now offered on mid-line Quests. Dual sunroofs are available on the SL and LE models. The Quest has mostly skipped other cutting-edge luxury features, like Chrysler's uConnect wireless hotspot or Toyota's wide-screen DVD entertainment system. 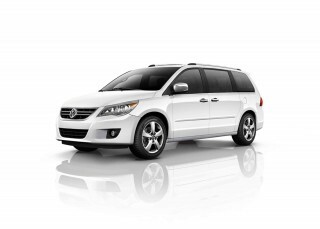 Gas mileage is in the ballpark of the top-selling minivans, thanks to the Quest's CVT. The EPA hasn't yet published the official gas mileage numbers for the 2013 Nissan Quest, but with no mechanical changes, it's expected to carry over last year's figures. 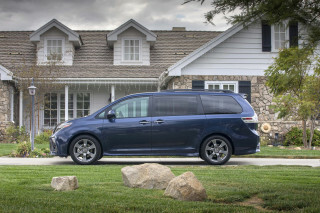 Those put it on roughly equal footing with the top-selling minivans, especially now that the Toyota Sienna is losing its four-cylinder engine option. The Quest doesn't fare as well as some minivans on the highway side of the cycle. Its V-6 engine is coupled only to a CVT, and the duo was rated at 24 miles per gallon on the highway cycle for the 2012 model year. 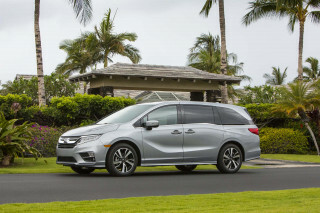 The Honda Odyssey earns 28 mpg on the highway in its most expensive, six-speed-automatic version; Chrysler's minivans and the related VW Routan get 25 mpg highway. However, for city mileage, the Quest is a leader. Its 19 miles per gallon on the city cycle equals the Sienna and the Odyssey, while Chrysler's minivans check in significantly lower. No hybrid or diesel editions of the Quest are planned.